The buzz surrounding business intelligence has certainly died down in the last several years, replaced by excitement over big data and predictive analytics. As one buzzword is exchanged for another, it’s important enterprises don’t lose sight of what all three implementations can mean to business operations. Business intelligence (BI) answers the “what happened,” predictive analytics answers the “what could happen,” and big data often raises new questions – all of which help enterprises make more informed business decisions. Often used interchangeably, big data, predictive analytics and business intelligence have made their way into the core of many tech offerings today. Let’s explore real-world applications for using data to improve conversion and processes. Anyone who has visited an airport knows the difference between those that frequently fly with a specific airline and those who do not. These loyal flyers are rewarded with front-of-the-line privileges and exclusive lounges, as well as perks not seen by fellow flyers (like free flights or upgrades). Airlines do what every business should do, which is see who their best customers are and measure what happens when they treat them differently. It’s nowhere near a new concept, but many companies, particularly retailers, fail to find their VIPs and target them individually. A variety of companies offer the data to locate these valuable customer segments and promote offers to them, but perhaps not with the ease in which Monetate offers. The Monetate platform empowers enterprises with big data insights, personalization, merchandising, testing and analytics to anticipate and react to customer behavior. With Monetate, for example, a retailer could use email to drive existing customers to its site with a “VIP” message and promotion, then carry over that same messaging to the site on both the landing page and a promotional banner reminding the visitor of the VIP promotion on every page that person visits. This tactic proved to increase conversion rate for one Monetate retailer by nearly 7 percent over the holiday season. Brands, however, need to be able to do this kind of personalization at scale. It’s easy for a merchant to find eight customers and treat them well, but large enterprises have different groups with different needs and targeting each with personalized landing pages, emails and banners can be a creative burden. According to Bruce Ernst, VP of product management, Monetate spent a lot of time in the last year being able to do this at scale, offering an easy-to-use content builder to reduce the creative burden for enterprises. Monetate’s content builder works very similar to how one layers different photos, text and other elements in Adobe Photoshop. When building their creatives, Monetate users can add, remove and edit “layers” to create different campaigns for different groups. For example, a retailer could send a promotion to its most valuable customers where it is currently raining and another to its most valuable customers where it is snowing. The content builder lets the marketer add layers so that the images and text are relevant to that promotion (e.g. rainy day hero image versus snowy day hero image). The creative is then used for the email and corresponding landing pages and website banners. Finally, a company can add a snippet of HTML to its emails (containing dynamic content - rainy day, snowy day, etc.) so that the images and copy change if the weather changes in that person’s area at the time of opening, it’s called Open-Time Personalization from Monetate. It’s truly a marriage of knowing what happened (customers’ past shopping behavior) and questioning what could happen (personalizing campaigns based on location and customer segment) to drive conversion. 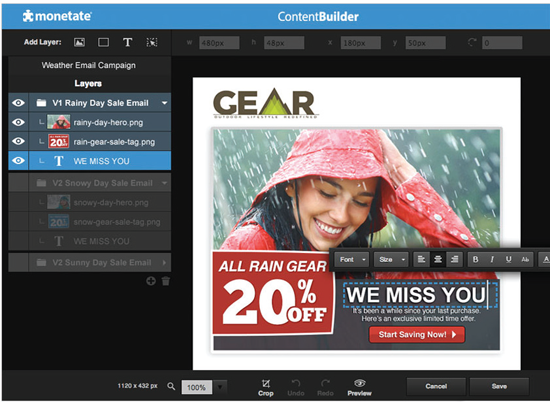 Monetate’s content builder lets marketers easily personalize marketing campaigns at scale. Perhaps no digital initiative is as hot as content marketing is in 2015. Brands are creating content at a rapid clip under the guise it will improve brand loyalty, awareness and, eventually, conversion. Only 35 percent of business-to-business marketers, however, have a documented content marketing strategy, according to a recent study by the Content Marketing Institute. Further, less than half (48 percent) say they have a content marketing strategy, but it is not documented. Fortunately for data-driven enterprises, the tide is turning. Brands are monitoring social conversations (through Hootsuite, Sprout Social, Brandwatch and more) to inform content creation decisions by understanding what has happened (what customers are talking about) and what could happen (if they create content based on existing social conversations). New to the business intelligence scene, Uprise.io enables content marketers to discover and analyze the top performing content within their vertical, see which social network is responding best to content and view influencers and sharers across verticals, publishers or specific articles (see image). Enterprises can use Uprise.io to quickly validate content ideas at the planning stage, accessing a wealth of data that can be used to shape and support ongoing content initiatives. The ability to analyze influencers sharing habits and build targeted lists of influencers to market to, means marketers can maximize the chances of getting experts to engage with their content. It’s anyone’s guess what next year’s buzzword will be, but enterprises looking for meaning in their data about what happened, what could happen or what they never thought to ask are creating a more intelligent future, full of conversions and data-driven processes.